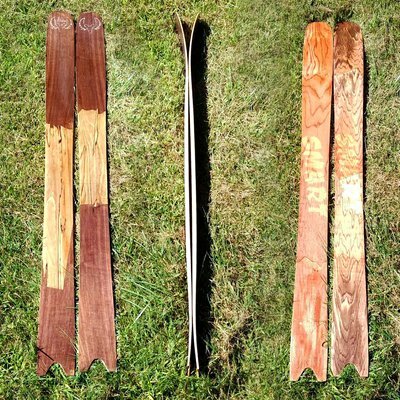 Have a pair of handmade all wood powder skis for sale called the Hick Sticks. A little info on the Hick Sticks, Tight powder filled trees? No problem. Spring time corn harvest? Bring it on! The Hick Sticks are made for the soft and slush. The big rocker nose helps to keep the skis afloat while the short swallowtail allows for a quick turning surfy feel. Having no metal edges definitely helps with the surfy feel, but don’t worry you can still rip a turn just avoid super hard pack days. Along with no metal these skis are plastic free. The bases are a thick hickory veneer protected by a layer of thin fiberglass. Why you might ask? Because the less plastic the better. The rocker, swallowtail, all wood lay up with fiberglass/carbon adds up to a playful and versatile ski. Size 172cm 131/112/125, $350 paypal only and free shipping. A little short edit from last season to see them in action.